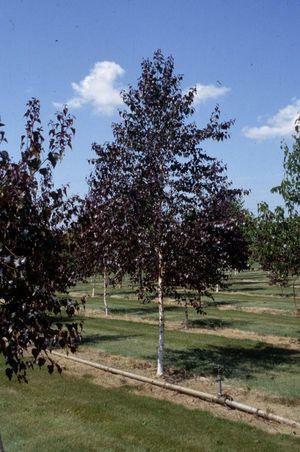 Royal Frost Birch is the second generation of red leaved, white bark birch. A cross between Whitespire Birch and Crimson Frost Birch. Royal Frost Birch has the upright habit of Whitespire Birch and the red leaves of Crimson Frost Birch. There is no weepiness that Crimson Frost was known for. The plant is vigorous with deep red-purple leaves and white bark. Royal Frost Birch is not borer resistant. Proper placement in the landscape to reduce stress is important. A location that offers shade to the soil around the roots and adequate moisture during hot periods will benefit this plant.